Running his Bant Spirits to back-to-back Top 8s, Ondřej Stráský claimed Gold and the title of GP champion, defeating hometown hero Joel Larsson in the finals! The hashtag for Grand Prix Stockholm is #GPStockholm. Join the conversation. The 2017–18 season ended with a bang! Argentina's Luis Salvatto had been jetting around the world for weeks in his quest to catch up with Seth Manfield in the race for the title of Player of the Year. By reaching the quarterfinals he succeeded in that goal, forcing a future playoff between the two. Of course, the end of the season brought lots more storylines to their conclusion. Joel Larsson became captain of this year's Swedish team, for instance, and Ondřej Stráský made it to the Gold level in the Pro Players Club. It was these two pro players who battled for the title and trophy in the finals, running the two most successful decks of the weekend too: White-Blue Control for Larsson and Bant Spirits for Stráský. Just a couple of weeks ago, Stráský had already reached the semifinals of Grand Prix Prague with the same deck. Back then he had said he was about to retire from professional Magic. But he kept up his spirits and his Spirits certainly kept him up. Congratulations to Ondřej Stráský, champion of Grand Prix Stockholm 2018! 1,322 players traveled to Sweden this weekend for Modern and for the final Grand Prix of the 2017–18 season. 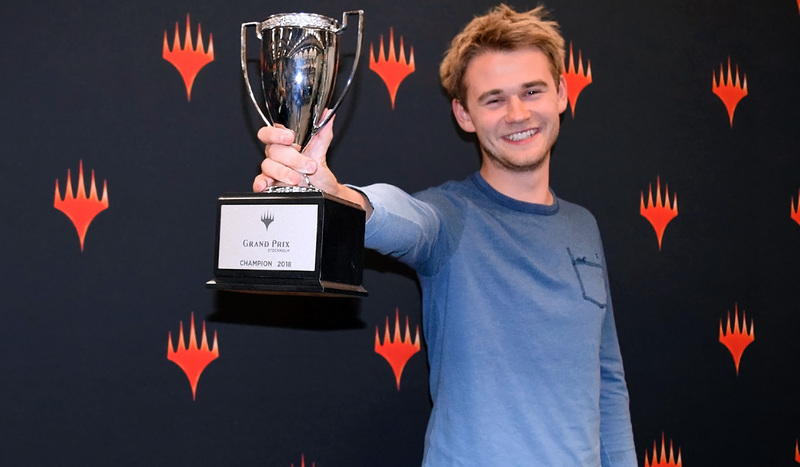 Most notable among them, both Reid Duke and Luis Salvatto came from the other side of the Atlantic; tied for second place in the Player of the Year race, they were trying to pass current front-runner, the absent Seth Manfield. One of the two was eliminated on Day 1, but the other did quite well. In fact, nine players managed to go 8-0: Karl Oscar Persson, Julian Felix Flury, Thomas Enevoldsen, Joel Larsson, (3) Luis Salvatto, Oliver Moon, Gonçalo Pinto, Ivan Floch and Erlend Hegni. With Modern as spectacular as ever, with a Player of the Year race still to be decided, and with such a cast of stars, Day 2 was not to be missed! So tune back in on Sunday when we return for the epic conclusion of Grand Prix Stockholm 2018. Until then, this is good night and sweet dreams from Sweden!